Bank holidays give the opportunity to spend a long weekend in the hills, the only problem being that those hills can get awfully busy. 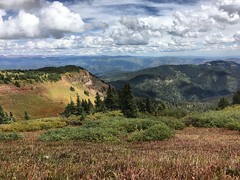 I am a misanthropic hill walker and prefer solitude to splendor so am always seeking out the quieter spots in this crowded Isle. However there are still places that offer splendor and solitude. I have just got back from one such spot. 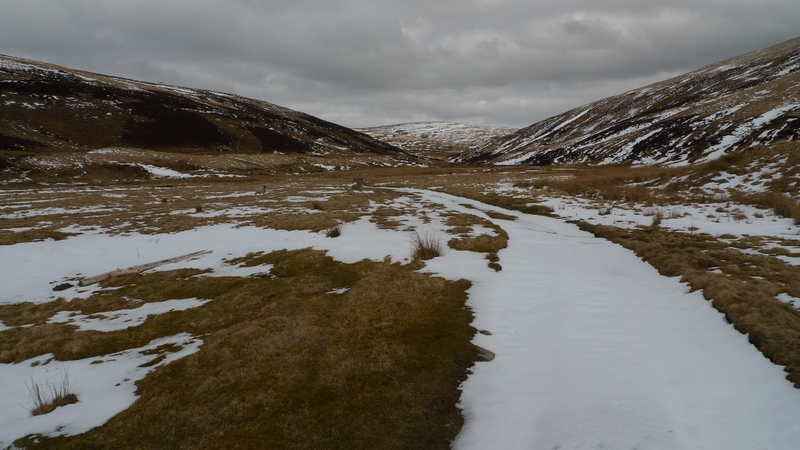 The plan had originally been to do a 3 day backpack around the stunning interior of the Galloway forest park, a route that would have offered some of the largest tussocks imaginable to get my teeth into. A grand route was planned with some big days which are needed to get into and out of this wild land. However come mid week I was starting to feel drained and was beginning to just fancy a long lie in. A new plan was hatched, enjoy the hills with a daysack and then spend the night in the comfort of the Bongo. I found some cracking spots to park up for the night, tiny car parks deep in the forest. You know that you are somewhere remote when you drive for 9 miles without passing another vehicle and then spend an undisturbed night with only a cuckoo for company. A couple of great walks were had including a visit to the remote Clennoch bothy and a demanding circuit of the Rhinns of Kells. The Rhinns of Kells are a superb range of hills and even include a Corbett to tick off. Rugged Scottish scenery and I only saw two couples during the whole day, pretty good considering it was bank holiday Sunday. 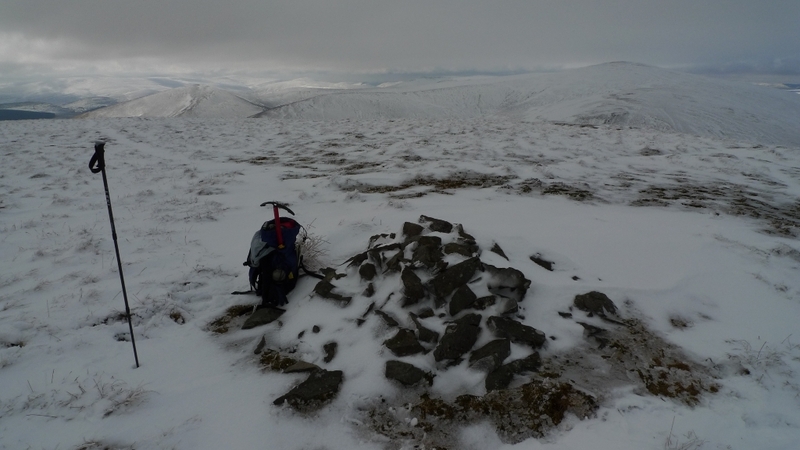 A quick photo taken during the ascent of Meikle Millyea. Today was meant to be spent tramping the northern part of the Rhinns of Kells but I woke up feeling decidedly groggy. A shame as the day dawned bright, hot and sunny. I could not summon the energy to climb hills and then drive the 6 hours home. 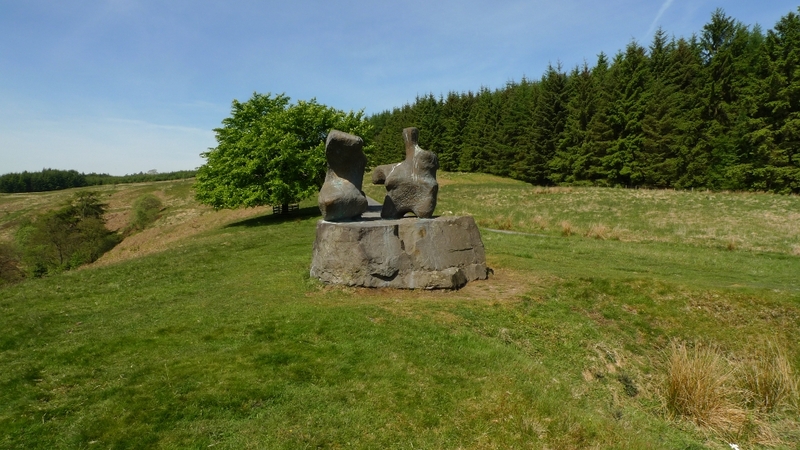 Instead a quick visit to some sculptures on a scenic drive back. 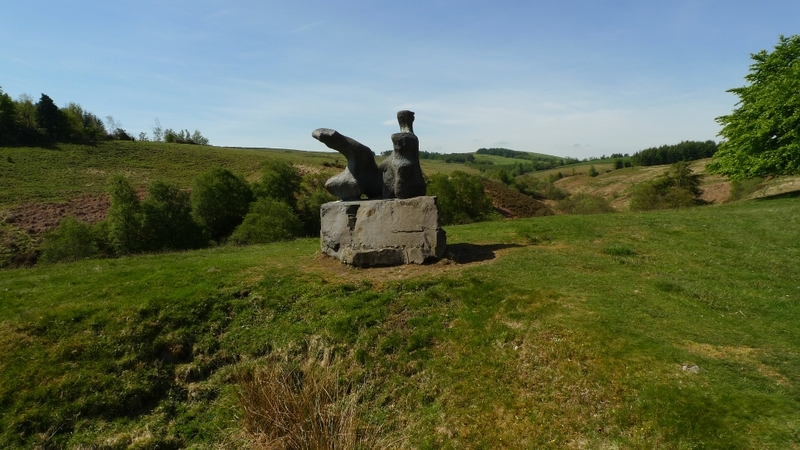 The area around the Glenkiln reservoir has several sculptures scattered around by artists such as Henry Moore. Well worth turning off the A75 for an hour or so. I even spotted my first ever red squirrel. Anyway a write up of the walks to come soon, I just need to get it together to do reports of the last two backpacks first! I am a very excited man. 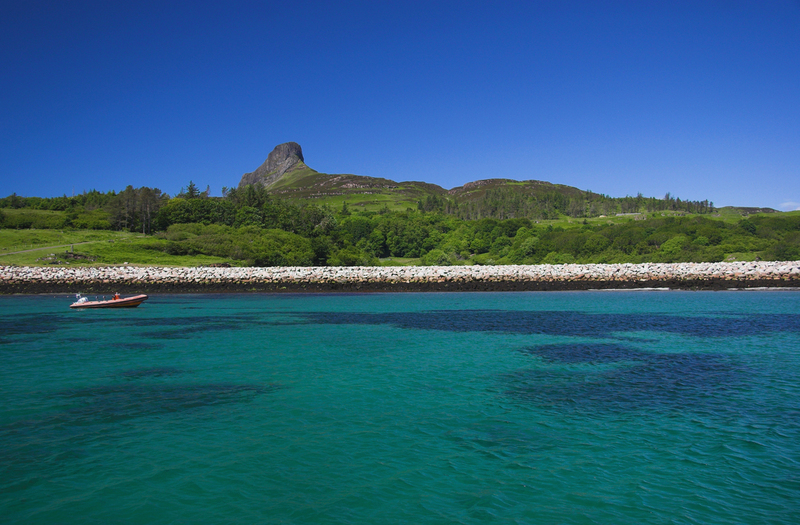 A few weeks ago I found that some of my favourite artists were playing a music festival on the Isle of Eigg! The Fence Collective is a record label run from a small village on the Fife Coast, including artists such as James Yorkston, The Pictish Trail and King Creosote. They have been doing a festival every year in their village but it has always sold out before we have managed to get tickets. I was therefore sitting at my managers computer bang on midday to secure tickets for myself and my partner on their first ‘away’ festival. Tickets are limited to 150 which should give a great intimate atmosphere and I have always wanted to visit the Isle of Eigg. This stunning photo I found makes the island look almost tropical. Anyway if you are looking to discover some new music you can’t go wrong by checking out this lot who will be playing in the village hall on the Island at the end of September. Sometimes it is good to escape into the hills just for a couple of hours or so. I was kicked out of the cottage that I had rented at 10.00am and did not want to drive straight home. I decided to head to the other side of the Lowthers to see if I could get a different perspective on what had now become familiar hills. I found a small grassy pull in where the Southern Upland Way crosses the A702 . As I was putting my boots on a farmer zipped up on his quad bike with two Border collies riding shotgun at the back. A friendly chap, he was interested to know where I was heading and warned me to be careful as there was still some deep snow up on the hills. He was going round his land picking up dead lambs, the recent snow had come at exactly the wrong time for hill farmers. He also warned me to be carefull around the cows on the hillside as they had newborn calves and were known to be aggressive if you got in between them. The pleasant exchange was ruined slightly at the end when he managed to make a racist comment before biding me farewell! 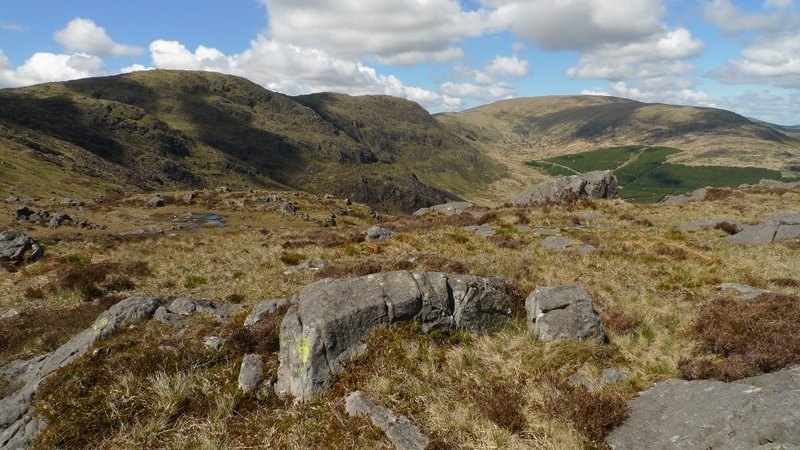 It was a muddy initial climb up the Southern Upland way due to the boggy ground having been trampled by cattle. 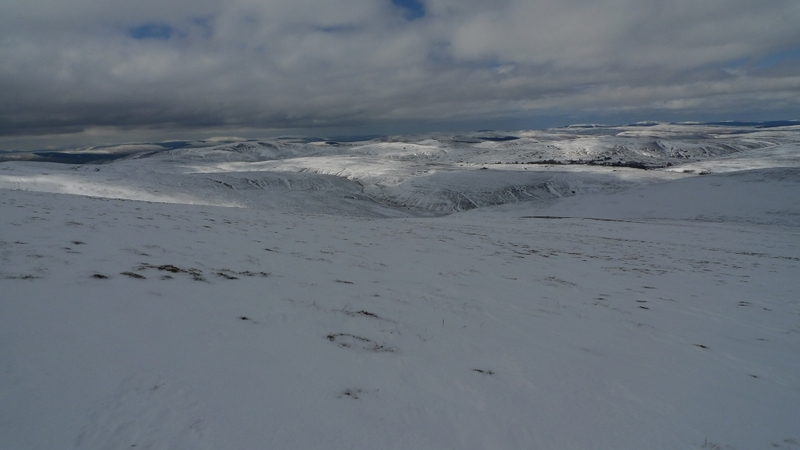 However height was quickly gained and I got a good view of the Lowther hills looking pretty similar to the Howgill fells once again. 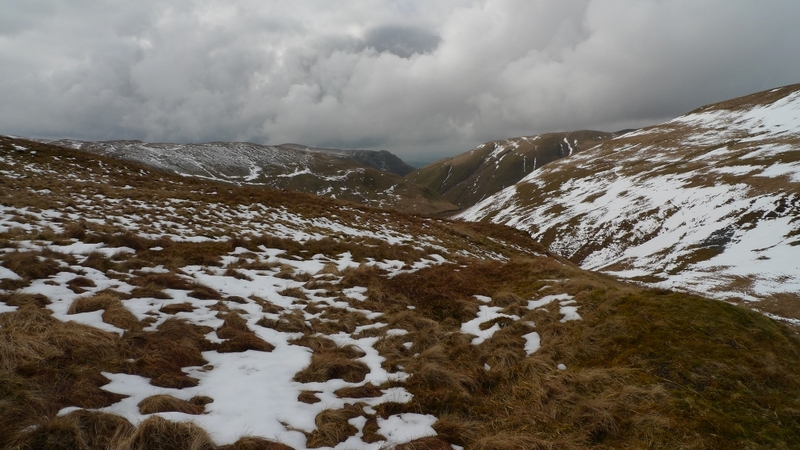 In my planning haste I had not spotted that there is a fair drop between Laght hill and the ridge of Comb head. It was here that I noticed very dark broody clouds bubbling up in the distance. They were already beginning to skim the hill tops a few miles away and were heading my way. I was determined to get to the top of Cold Moss whilst I still had a view. The ridge between Combe Head and Cold moss is just about narrow enough to stop it being a dull moorland plod. 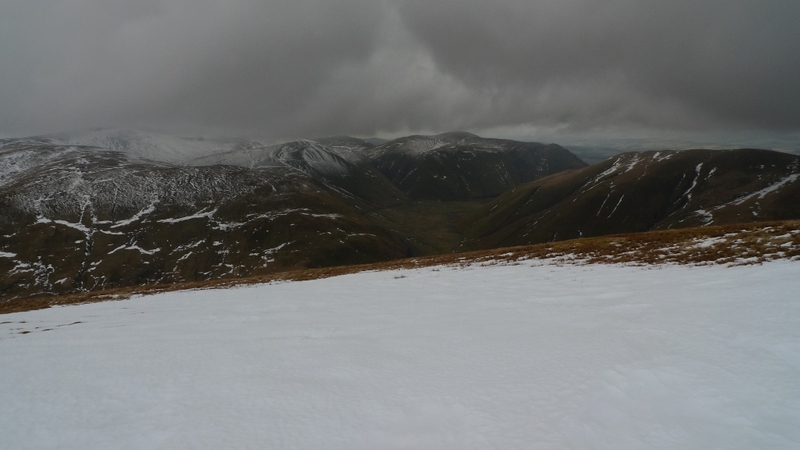 The clouds were now only just about scudding above my head but the view down into the Dalveen pass was pretty impressive. There is something about these steep sided grassy hills that really appeals to me. The summit of Cold Moss was pretty nondescript and I did not stop, instead heading straight down the ridge in an easterly direction from Inner Comb. I was soon engulfed by hill fog and heavy rain which made the already wet snow even more unpleasant to walk though. 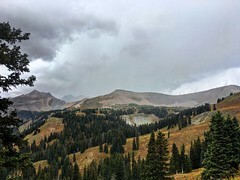 At the foot of the ridge I spotted a hut which I hoped would give me shelter from the rain and somewhere to sit and drink my flask of coffee. Alas it was locked but there was a porch from which I could get my camera out and snap the now gloomy hills. I assumed that the track marked on the map would give good quick progress back to the van. It did until I was met by a gate with a sign saying that the track ahead was private and there was no right of way. I could have gone for it but my map showed it going through the farm and I was not up for being chased by dogs or having to explain why I had ignored the sign. A quick look back up the valley and I took a steep line directly up the hillside before contouring round the farm and back onto the Southern Upland Way. A great couple of hours on the hill and I was now ready for the drive back to Nottingham and the hustle and bustle of city life. It had been hard work digging out the van the night before. The snow in the village had turned very wet and heavy and it felt like every shovel full weighed a ton. As I drove towards Elvanfoot along the twisting mountain road I lost a fair bit of height and the snow began to diminish. 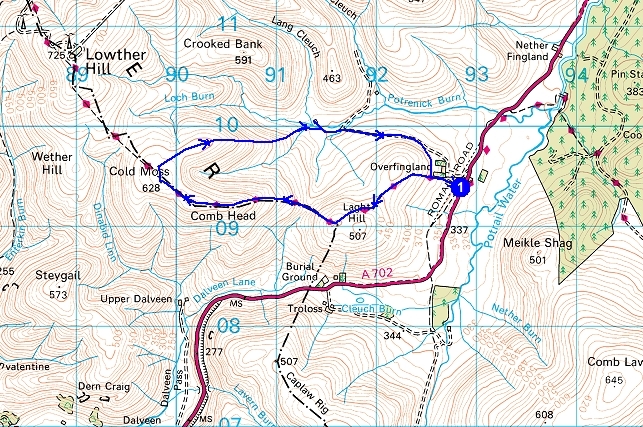 My map showed a very steep bit of ground on my route today amongst the usually rounded hills. 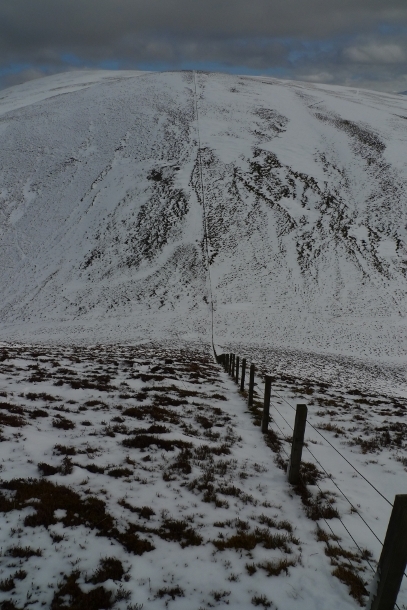 A small bit of mountain had been slipped in between Black Law and White Law. I decided to err on the side of caution and packed both ice axe and crampons, you never know I may actually get to use them for once. The polluter was left parked next to a cattle grid not far from where the disused railway line crosses the road. I could hear the low rumble of the M74 from here which was a bit of an intrusion after the solitude of the last few days. 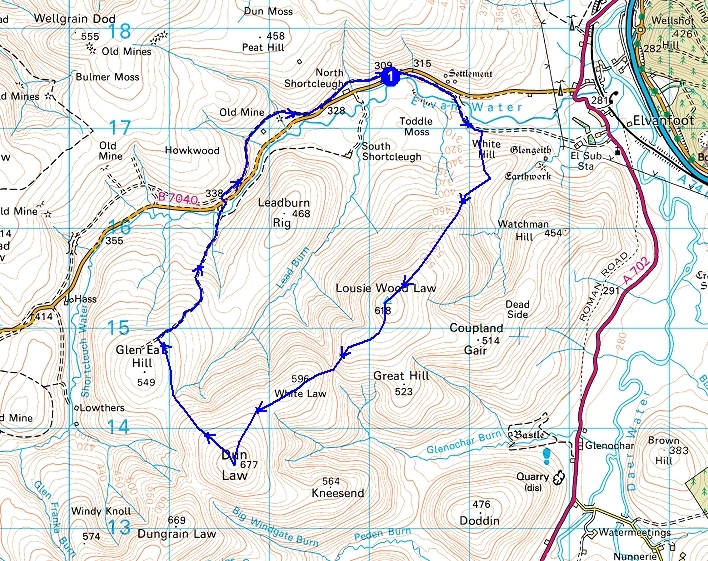 This is another walk that I would recommend as a way of breaking a long journey north or south. 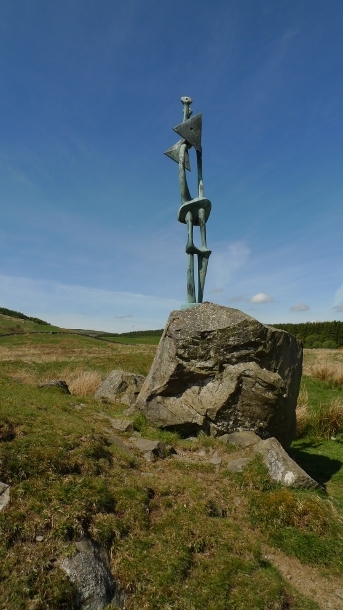 The start is only a few minutes drive from junction 14 and Elvanfoot village. The old railway track gives quick and easy progress down towards the viaduct marked on my map which crosses Elvan Water. I began to curse because ahead of me there appeared to be a distinct lack of one. Oh well there is sure to be a footbridge? My confidence rose when to the right of the track to the river I spotted the bridge I was after. Confidence once again led to disappointment when I realised that the ‘bridge’ was in fact a telegraph pole positioned across the not insignificant river with a trap set in the middle of it. Oh well at least I could straddle it and shuffle across, somehow manuvre over the trap and get to the otherside? No chance as whoever had engineered this crossing that was not designed for man, had attached a knee height wire fence along the length of it. Not high enough to provide a handhold to enable an upright crossing, but high enough to prevent a bum shuffle. I spent a few minutes cursing, weighing up the pros and cons of wet feet in the cold river (it was knee deep and crossable but full of freezing snow melt) or an attempt at walking across the pole with no hand holds. I went for the walk across option, very mindful that if I slipped forward the knee high fencing would mean that I would also end up going face first into the river six feet below me. Thankfully after a lot of faff I got across in once piece with the people at the OS being given colourful names under my breath. I clambered back up to the old railway track and looked back to where it ended on the other side of the river. It definitely did not look like there had been any sort of viaduct for years now. I then crossed a stile and wondered why someone had gone to the effort of puting one over a low fence when you really had to struggle to cross the river……………. The hum of the motorway accompanied me on the easy ascent of Louise Wood Law, the stretch of tarmac and toy sized cars shrinking as I gained height. 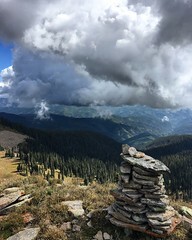 The views however were extensive and when I reached the summit I was greeted with a great panorama. From this vantage point it looked like it was a straight forward level walk to Dun Law, as the steep descent and reascent of the imaginatively named Little Windgate Hass was out of sight. I did have visions of having to put on my crampons or self arresting with my ice axe but luckily there were patches of grass and heather sticking out of the snow. Getting up the other side was a bit of a slog an I always find steep grassy slopes more difficult to climb than steep rocky ones. Maybe it’s getting your arms involved as well on rock that makes things that bit easier? 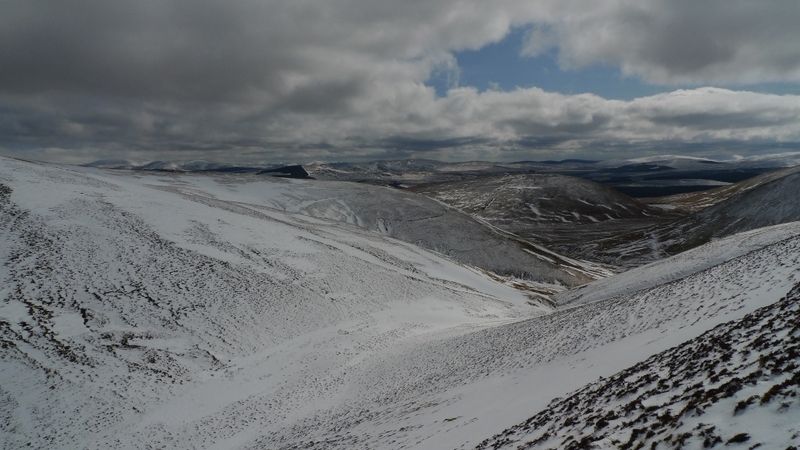 Dun Fell gave another big snowy panorama with the masts of Green Lowther still white with snow plastered to them. A completely different day up there compared to when I was battling gales and driving snow couple of days ago. 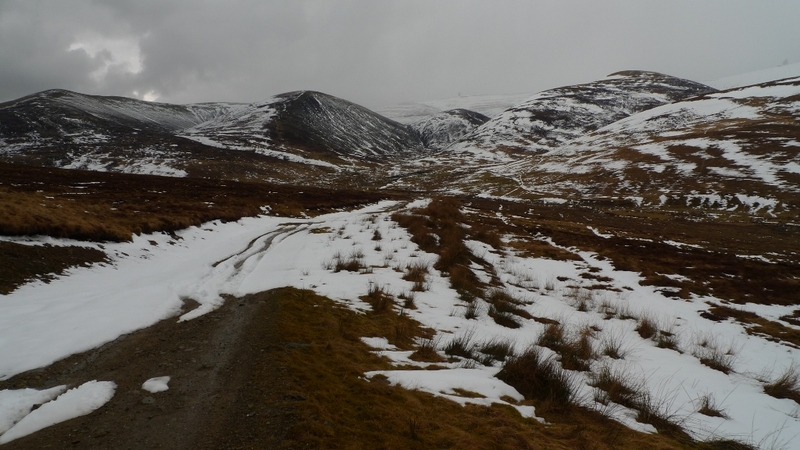 It was now all downhill through virgin snow which enabled me to break out into a lumbering sort of run to the col before Glen Ea’s Hill where I struggled through deep heather trying to locate the landrover track off of the moors. Down in the valley most of the snow had now melted and I was worried that the unbridged river would be difficult to cross. There was a wide shallow ford which I calculated could be crossed with dry feet if I ran across. Only one boot filled with water! The disused railway track a short but steep climb up the other side of the valley gave quick and easy progress back to the van. I would imagine it would a pleasant route for a bike ride though the hills.